(Coastal Living) -- From open-air tropical bungalows to luxe tree houses, let these idyllic hideaways decrease your carbon footprint as they expand your horizons. 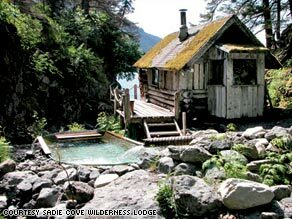 Alaska's remote Sadie Cove Wilderness Lodge has been welcoming guests for nearly 30 years. Bermuda is usually formal, but there's no need for evening dress at this casual out-post. Six of the 84 rooms are over-the-water cabanas that include a window in the floor so you can peer down at fish. Eco cred: Ocean breezes make using air-conditioning unnecessary, so your carbon footprint practically disappears. Insider's tip: Hi Tide, the resort's main restaurant, turns out some of the best meals on the island. Try the blackened rockfish with grilled shrimp and dill sauce. Hand-built from milled driftwood, this remote inn inside Kachemak Bay State Park has been welcoming guests for nearly 30 years. With just five cabins, the hosts guarantee peace and quiet. Eco cred: Wind and hydropower mean guilt-free electricity, and all water comes from a swift mountain stream. The lodge ships out its recyclables for proper processing. Insider's tip: Take a flight over beautiful, volcanic Augustine Island. Coastal Living: How green are you? Stay in roomy safari tents nestled in Australia's western dunes. This resort borders a national park and offers from-the-beach access to coral reefs teeming with tropical fish. Eco cred: Ningaloo has the bases covered with solar power and composting toilets. About 780 miles north of Perth, the retreat is free from light pollution, meaning great stargazing. Insider's tip: Swim with whale sharks, which migrate through the area from April to June. Sounds scary, but they're harmless to humans. Cost: About $900 per night per tent for two, including meals and activities; 011/61/ 29/571-6399 or salsalis.com.au. Nestled between Los Padres National Forest and the Pacific Ocean, this getaway remains true to the region's hippie roots. The comfortable yurts include queen-size beds, pine flooring and decks overlooking the coast. Guests can hike through redwood forests, kayak in the marine sanctuary, or indulge in an in-yurt massage. Eco cred: Treebones heats its pool, hot tub and common areas with a clean-burning generator. Insider's tip: Is a yurt too tame for you? Spend the night up a tree in an eco-nest, a bed of woven wood, bird's nest style. Cost: Yurts begin at $155 per couple per night; 877/424-4787 or treebonesresort.com. Yediburunlar means "seven noses," the Turkish description of the seven bays that make up the Turquoise Coast at the Mediterranean's eastern end. This six-room inn delivers seclusion in a big way. Though the structure isn't technically a lighthouse, guests will find sweeping views of the sea where Jason and the Argonauts once sailed. Activities include coastal hikes, local excursions and sailboat cruises. Eco cred: Solar panels heat the water, and recycling is a priority. Insider's tip: Innkeeper Semra Aydeniz welcomes guests into the kitchen to learn how Turkish specialties are prepared. Cost: From about $1,650 per couple per week, including flights from London and most meals; 011/0208/605-3500 or exclusiveescapes.co.uk. Eco cred: The Colony composts waste and has banned plastic foam containers, aerosol sprays and plastic bin liners. Trash baskets in each room have four compartments, allowing guests to sort recyclables. Insider's tip: Pick up a recycled souvenir. The hotel turns worn bedspreads and linens into handcrafted dog blankets. Cost: From $99; 800/552-2363 or thecolonyhotel.com. Arrive at this Indian Ocean retreat on the hotel's private plane. Once settled into one of 25 rosewood villas, guests can take guided hikes through the tropical forest, snorkel, mountain bike or even water-ski. Eco cred: Anjajavy has brought economic development and health programs to a remote and poor corner of the island. The property is next to an 1,100-acre nature preserve. Insider's tip: Don't miss afternoon tea in the Oasis garden, where birds and lemurs are as much an attraction as the cake. Cost: Villas from about $540 per couple (higher in April), meals included, plus $680 round-trip flight per person from larger cities on Madagascar; 011/26/187/366/275-0676 or anjajavy.com. More than 30 years ago, the granddaddy of today's eco-resorts opened on St. John with a radical idea: Travelers would willingly stay in tents with communal baths if it allowed them easy access to a deserted beach and ocean breezes. More than 1 million guests later, no one's doubting. Eco cred: From the arts center where guests create souvenirs from recyclables to a make-your-own-bed approach to housekeeping, Maho sets the standard for low-impact travel. Insider's tip: If a safari tent sounds too close to nature, try the newer Estate Concordia Studios -- same concept but with a solid wall between you and the elements. Cost: Studios from $95; 800/392-9004 or maho.org. Going green doesn't mean giving up luxuries at this eco-chic getaway about 15 miles north of the Costa Rica border. Perched in the forest, open-sided bungalows await guests, who can fall asleep to the sound of the Pacific and wake to the calls of monkeys. Eco cred: The 4,400 acres remain a nature preserve and sustainable tree farm, where 1.5 million trees have been planted in the past decade. Insider's tip: Order a rum drink. Sugarcane is grown on site, and the resulting molasses is distilled to produce a sweet, potent spirit. Cost: From $438 per couple, including meals and activities; 011/505/670-7676 or morgansrock.com. The Dominican Republic offers more than giant resorts and all-inclusive buffets. Natura Cabañas shows another side of the Caribbean, with a private beach for just 11 palm-thatched bungalows. The modern spa's services include a heavenly chocolate wrap. Eco cred: The cabanas are built from natural materials. Screened walls and windows keep it comfortable without air-conditioning. Insider's tip: Unwind at the resort's new yoga pavilion. Classes include one that mixes yoga and Pilates. Cost: Rates begin at $180 per couple; 809/571-1507 or naturacabana.com.